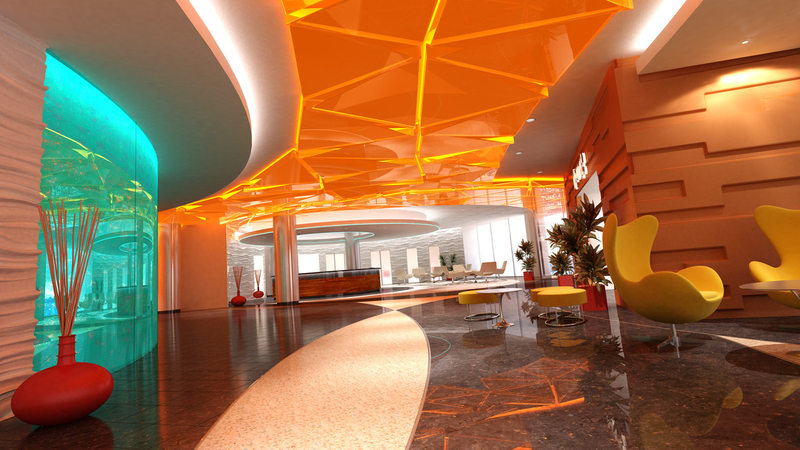 This space was originaly designed as a hospital lobby. The original design which was relatively close to this was scrapped so I decided to have some fun and turn the space into a hotel lobby. The basic form was kept in tact. All I did was play with the materials, acrylic ceiling tiles, furniture etc. I originaly intended to turn the blue glass wall into a window into an outdoor swimming pool, but I was working on finishing this for a publishing deadine (and actual work) so I kept is as a blue glass wall. This image was published in the first edition of the Inspirato book along with the Cylinder City image.